The forestry policy developed in Niger from the early 1930s until 1990 was marked by the preeminent role played by the colonial government, and subsequently by the government of independent Niger. In 1990, following the Maradi Conference in 1984, the importance of bringing local populations in on the process of forest management, after almost 70 years of being excluded, was finally accepted. In 1989, Niger adopted the Household Energy Strategy (HES) as a major axis of its forestry policy, choosing to prioritize the issue of firewood supplies for urban centers through community forest management. This policy, enacted by “decree 92-037” almost 20 years ago now, authorizes the creation of rural wood markets and allows rural communities to levy taxes at source, thus taking real ownership of their resources. After such a long period of exclusion, however, there is still some way to go in implementing this initiative. The hoped-for changes cannot be made to happen just by snapping ones' fingers, and this new power accorded to local populations has met with considerable reserve and much opposition. From 2007 to 2011, the rural district of Torodi introduced a major innovation in the implementation of the HES, improving the forestry control of woodfuel flows by setting up a communal monitoring unit, fully funded by the municipality. The HES is now in a position to consolidate its long-term viability and ultimately to improve the well-being of these populations. La politique forestière développée au Niger du début des années 1930 à 1990 a été marquée par le rôle prééminent de l’Etat d’abord colonial puis du Niger indépendant. En 1990, après le débat de 1984 à Maradi, le constat a été fait de l’importance d’associer, après près de 70 ans d’exclusion, les populations riveraines à l’aménagement forestier. En 1989, le Niger adoptait la Stratégie Energie Domestique comme axe majeur de sa politique forestière en faisant le choix d’aborder prioritairement la question de l’approvisionnement en bois de feu des centres urbains par l’aménagement forestier communautaire. Depuis près de 20 ans de mise en œuvre, cette politique initiée par le décret 92-037 qui autorisait la création de marchés ruraux de bois et accorde la possibilité de percevoir des taxes à la source qui permettent une réelle appropriation de leurs ressources. Cet effort, après une longue période d’exclusion, reste à poursuivre. Les changements attendus ne peuvent être décidés d’un claquement de doigt et ce nouveau pouvoir donné aux populations suscite de nombreuses réserves et oppositions. De 2007 à 2011, la commune rurale de Torodi a apporté une innovation majeure dans la mise en œuvre de la SED en améliorant le contrôle forestier des flux de bois par la création d’un corps communal dédié à ce contrôle qu’elle prend entièrement en charge. La SED est en mesure de renforcer ses conditions de pérennisation et in fine d’améliorer le bien être de ces populations. La política forestal desarrollada en Níger desde el comienzo de los años 1930 a 1990 se caracterizó por la función preponderante del Estado colonial después de la independencia de Níger. En 1990, tras el debate de 1984 en Maradi, se puso de relieve la importancia de asociar, tras 70 años de exclusión, a las poblaciones ribereñas con la ordenación forestal. En 1989, Níger adoptaba la Estrategia Energía Doméstica (SED) como eje principal de su política forestal optando por abordar de manera prioritaria la cuestión del suministro de leña a los centros urbanos a través de la ordenación forestal comunitaria. Desde hace casi 20 años de aplicación, esta política puesta en marcha por el Decreto 92-037 autoriza la creación de mercados rurales de leña y concede la posibilidad a las poblaciones rurales de cobrar tasas por superficie que permitan una apropiación real de sus recursos. Tras un largo período de exclusión, este esfuerzo debe continuarse. Los cambios esperados no pueden decidirse con solo chasquear los dedos y este nuevo poder conferido a las poblaciones suscita numerosas reservas y oposiciones. De 2007 a 2011, el municipio rural de Torodi ha aportado una innovación capital a la puesta en marcha de la SED mejorando el control forestal de los flujos de leña a través de la creación de un organismo municipal consagrado a este control, totalmente a cargo del mismo. La SED está en situación de reforzar sus condiciones de perdurabilidad y mejorar el bienestar de estas poblaciones. Just as we were finalizing this paper, we were shocked to learn of the sad death, on January 19th 2012, of Amadou Oumarou, Niger GESFORCOM coordinator since July 2007, and coauthor of this paper. As a key actor in the project, and a tireless coordinator of the work conducted in liaison with the NGO ABC Ecologie, INRAN, CIRAD, and the DGEF, Amadou enabled Niger’s Domestic Energy Strategy to make real methodological advances in the sustainable supply of firewood for the city of Niamey. Through close collaboration with the municipality and the forest station of Torodi, he demonstrated that the idea of Decentralized Forest Management, self-financed by an innovative forestry tax, could become a tangible reality. We keep in mind the memory of a forestry engineer of great worth, who – in his work – succeeded in achieving all of the objectives set by the project for the sustainable management of the forest stands of Torodi. We shall endeavor to pursue his commitment. 1From 1935 (promulgation of the decree of 4 July 1935 on forest management in French West Africa) to the beginning of the 1990s, the forestry policy followed by the colonial government (to 1960) and subsequently by an independent Niger was marked by the preeminent role played by the state, as represented by its forestry services. The aim was to put the main forest areas out of reach of local populations and to start classifying them. The creation of these reserves – managed by the administration so as to keep out local inhabitants, who were deemed responsible for every instance of environmental degradation (Bergeret & Ribot, 1990) – was designed to protect and preserve the forests. 2This policy of protecting and preserving the forests proved ineffective. Up until 1960, the year of independence throughout much of Africa, the French government did what it could to maintain their condition. But the last forty years have seen a relentless degradation of the natural forests (Montagne & Bertrand, 2006). 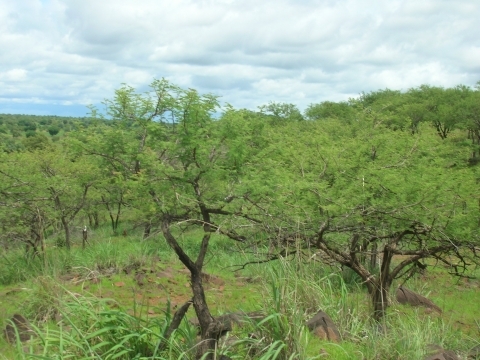 3Although Niger’s forestry capital presented no great economic or strategic interest, certain administrators became concerned about the future of these natural forests (Yamba, 1993) and actively supported the implementation of the policy by classifying forest areas, particularly from the 1950s onward (Yamba, 1993). The “Aubreville decree” of 4 July 1935 set out the laws and regulations embodying, in French West Africa, the colonial principle of state appropriation of vacant or unclaimed land. These texts opened the way for the nationalization of most of the land, which was, to a large extent, grouped together in the private (or protected) domain of the state. The forestry service opted to concentrate its limited means on the public domain (or land classified as “state” land) or protected areas. They also instated the Service Forestier, a paramilitary unit tasked with enforcing the laws in order to achieve precise quantitative targets, for example in terms of replanting rates and the demarcation of the classified domain (Montagne & Bertrand, 2006). 4The implementation of the policy therefore depended on the creation of this colonial forestry corps, building on a long tradition of forest rangers (created by a decree dating back to Colbert in the 18th century), and of fighting with and expelling rural populations from forest areas (Bergeret, 1993 &1995). It could only be effective in a context where the state fulfilled its human, material and, of course, financial obligations. 5Colonial forestry policy was thus directly affected by the vagaries of France’s own forestry policy; the 1935 decree contains most of the provisions by which foresters sought to protect the forests from peasant farmers or cattle herders. It looks for general solutions, with the aim of imposing reforestation; it denies the reality of demographic expansion and sees the main danger threatening the tropical forests as rural man, whether peasant or pastoralist. 6For the peasant farmers, by contrast, the wooded environment is a natural prolongation of the fields, an inseparable part of the village’s territorial space. “In their view, it is only natural for the clearing of land to encroach a little on the wooded areas that border the fields” (Bertrand, 2006). 7Si it was that, from 1935 to 1960, the colonial government put in place forestry regulations based on repression and exclusion (Bertrand, 1985). The texts governing forestry entrusted direct and exclusive management of the forests to the administration and, accordingly, organized the forestry services around the repressive tasks of forest policing. This vision – at root an honest one, stemming from a desire to do to right thing – was nicely summed up by Lavauden in 1934 in an article based on his experiences in Madagascar, but which could equally well have applied to Niger. “The dangers of which we warn call for urgent remedy. But, whichever measures we adopt, they will inevitably – if they are effective – stir up much discontent. As has rightly been said: to govern is to displease. And in forestry, where only the specialist can clearly distinguish the boundary between use and abuse, that is even more inevitable. Indeed, the number and violence of the protests against forestry regulation is probably the best measure of its relevance and effectiveness. Foresters are the natural guardians of permanent interests […] defending the future against the avidity of the present.” (Authors : Nowadays, this speech could easily be penned almost word for word by any of several international conservationist NGOs; the foresters have been replaced by life scientists). 8Until 1974, the 1935 decree provided the basis for the regulation and exploitation of all forest resources. Between 1930 and 1970, some 200,000 hectares of forest stands were classified. 9In Niger, this policy was implemented without substantial human and financial resources. The forestry administration staff, starting with 32 in 1949, reached a peak of 65 in 1955, which was still well below the required level for the effective enforcement of forest laws across such a vast territory (Yamba, 1993). The conclusion was obvious: the forest rangers would never be able to properly oversee the state’s private (or protected) domain. 10After independence, up until 1970, the process of classifying the forests was abandoned, while protective actions – usually in the form of forest policing in the protected domain, and at the start of planting projects – were continued. For some fifteen years, priority was given to monitoring protected or classified forests, and the monopoly of state management in classified forests was constantly reaffirmed. 11The staffing levels eventually increased (up to 473 officials, including 202 management staff, in 1981) (Najada, 1981) but remained low relative to the country’s total surface area (excluding desert areas). The determination of forestry staff to “stick” to the constrictive rules of the Code Forestier resulted in local populations being subjected to a number of injustices, due to official refusal to accept the validity of traditional usage rights. It made abuses of power more common, and drove a wedge between local populations and the officials, who were seen as “predators” rather than as a source of support. The corruption of forestry officials was encouraged by the weakening of the state, and by urban population growth pushing up the money to be made from the supply of wood. The central government, aware of these facts, and of the risks they posed to the credibility of the service, began looking for ways to improve its practices. 12In 1974, almost 15 years after independence, following serious degradation caused by the drought of 1973, Niger decided to bring in national legislation, and adopted the Code Forestier in the form of an Act of Parliament1. Although the drafters tried to get away from the colonial “model” of 1935, many elements of the Act recall the original decree, serving only to validate the technical options adopted by the colonial legislators, notably as regards the management of the forest stands in the state’s private domain, and the policy of guarding the protected domain, which represents most of the country’s natural surface area. 13Considerable progress was made in the legislation, particularly as regards the modalities for issuing fuelwood exploitation permits, which (under Article 48) must be accompanied by a specifications sheet drawn up by the forestry service. The authorities were keen to ensure that such operations could be carried out with a minimum of forest management. But under-manning made it difficult to exercise effective oversight, and, more often than not, no real ground-level inspections were carried out. 14Government order 22 of 4 June 1974 on the exploitation of fuelwood to supply large urban centers specified a minimum monthly quantity, for each category of transportation, to be used as a reference when issuing firewood permits in large urban centers. Looking at these figures, one notices the very low level of timber taxation: in the order of FCFA 0.12 (€0.0002) per kilogram, compared with the selling price of wood in the city, which at that time was FCFA 12.50 per kg (€0.02) (1981 prices, Club du Sahel) – less than 1% of the selling price. 15This low level of taxation was insufficient to enable the state to fund forestry control. 16Since 1970 – with rising global awareness of the importance of oil as an energy source, marked by the first “energy crisis” of 1974, followed by another in 1979 which has never really abated – Niger has felt the effects of the crisis. The main consequence is that it has forced urban populations to use wood to meet their domestic needs. Delwaulle & Roederer 1974 underlined, as early as 1974, the importance of wood harvesting in supplying the city of Niamey. 17By the end of the 1980s, it became clear that planting initiatives had failed, mainly due to insufficient production levels, which could never meet the urban demand for fuelwood. During the national conference of 1984 in Maradi, therefore, Niger officially envisaged a reassessment of the “forestry” dogma of planting, which had dominated the entire work of the forestry service since independence. The decision was made to take account of the problems of managing natural forest formations, particularly short stands of combretaceae. 18These recommendations resulted in the creation, between 1985 and 1990, of forest cooperatives. But, these openings aside, there was no fundamental rethink of the action of the forestry services, which continued with their usual practices, based on punishing infractions, notably in the protected domain. 19That a review of the legislation was long overdue is clear when one examines the fiscal aspects: between 1959 and 1987, the rate of taxation on logging operations remained unchanged at FCFA 35 (€0.05)2 per stere (cubic meter), rising suddenly to FCFA 350 (€0.5) per stere in 19873. 20This tenfold rise in taxes on marketed wood did not fundamentally alter the way operations were run, which carried on much as before, leaving the commercial operators free to decide where they cut their timber. 21The Maradi Conference had upheld the principle of more active participation of local populations in the management of their forested areas. The first forest management pilot operations were initiated by the PUSF (Planification et Utilisation des Sols et Forêts) project in the classified forest of Guesselbodi 12 miles to the east of Niamey. A forest cooperative was set up in 1986-1987 with the aim of improving the way the trees (principally Combretum micranthum, Combretum nigricans and Guiera senegalensis, the main species used in urban fuelwood supplies) were managed, by bringing in precise technical standards (minimum cut diameter, site rotation, cleanup and mulching, etc.). Box 2. Lessons learned from the forest management pilots (Hamadou, 1994). In fact, these forest management schemes remained under the influence of a forestry code that perpetuated the colonial decree of 1935 and left no real room for rural populations, who were seen as mere operatives to whom forestry officials gave orders, telling them to go and cut down trees in such and such a place. It is also worth noting that planting operations were implemented, following the Maradi Conference, in which the local populations were forced to participate. This “top-down” approach further excluded them from any initiative. 23The tax adjustments of 1987 did not contain any particular provisions specific to the forest cooperatives that might encourage villagers better to manage the forested land bordering their villages. All of these actions failed, in that as soon as the projects, funded by foreign sponsors, pulled out, the villagers would return to their old habits, ignoring the constraints implied by the various management schemes, which brought them no direct benefit. 24The real changes in forest management in Niger began in the 1990s, along with the development of the national democratic process and decentralization. 25The abovementioned failure of the forest cooperatives was due partly to the differential between the “administrated” prices, in the order of FCFA 1,500 (€2.30)4 per stere, and the prices observed in the unmanaged areas, of about FCFA 500 (€0.76)5 per stere. This differential led to a de facto boycott of the cooperatives’ sales centers by the haulage operators. 26These marketing difficulties were also due to the fact that the rural populations did not, from a legal point of view, have control over their forest resources. Commercial operators could extract products freely, without any forest management constraints. In 1992, the year of the cooperatives’ largest output, they supplied only 3.6% of the fuelwood needs of the city of Niamey – barely 5,000 tons of wood (Hamadou, 1994). Box 3. The challenge of the 1990s for the sustainable management of periurban forest stands. The challenge for the 1990s was clearly set out: to determine the legal conditions for this “participative” mode of management so that rural populations could feel themselves to be, if not the legal owners, then at least fully responsible for the management of the forest. 27In 1984, just as the first forest management actions were being rolled out, a general economic study was published on the forest-wood sector in Niger (Madon, Matly, Bertrand, Laurent, 1986) which confirmed the importance of the forest-wood sector for the economic life of the country. Every year, the inhabitants of Niamey were spending more than two billion FCFA (3 million euros) on the wood required to cook their food, making this one of the largest sectors in the national economy. The study stressed that the diversity of the economic actors involved in the sector, and the multiplicity of its supply chains, made it essential to take a global approach to the management of forest stands. And that by bringing in local populations, the approach should encourage them to manage the forests as part of a long-term vision – thereby confirming the conclusions of the Maradi Conference. ……… “When, in 1982, we drew attention to the timidity and ineffectiveness of the actions to combat desertification, some people saw it as a attempt to undermine certain projects”………. ……… “The few sporadic production plantations could not compensate for the wood taken from the natural brushland… A great deal of imagination was required in order to organize operations more efficiently”………. ……… “Stepping outside of the domain he legally controls (the classified domain), and moving into spaces governed by more complex rules of use (the protected domain)”………. But much remains to be done! ……… “There is, therefore, a pressing need for a wide-ranging and forward-looking clean sweep, to refine ideas that are only just taking shape, to specify our approach, and to arrive at a consensus that will enable us to organize and generalize the process the we have set in motion”………. 29This declaration demonstrated the extent to which the senior forestry officials, finally taking stock of past successes and failures, now accepted the idea of forest development being no longer an administrative matter but the concern of the entire rural population – farmers, herders, tradesmen or craftsmen – with support from the administration. It was upon this basis that a new approach was developed, with a more economic focus, but still keeping in mind the principles of the long-term management of natural forest stands. 30The quickly changing conditions of fuelwood supply for the city of Niamey, as the harvest zones became increasingly remote, were documented in 1974 by Delwaulle and Roederer, who were the first to report on the serious problem posed by the supply of firewood to the large urban centers in the Sahelian zone. In 1974, they estimated the length of Niamey’s wood supply chain at 60 km. Fifteen years later, the Energie II6 Project situated the main production zones at more than 100 km from the city. The time had clearly come for a change of strategy and of policy. To improve the conditions of management, what was needed was “to expand the government’s capacity to direct, coordinate and intervene in the field of domestic energy, through an increase in tax revenues aimed at the progressive self-financing of actions, at training, and at the strengthening of institutions” (Bertrand, 1995). 31Baptized the “Household Energy Strategy” (HES), this nationwide approach, stemming from the realization in 1986 of the importance of rural-to-urban wood flows, was designed to be the element of forestry policy that dealt with urban wood supplies. It set out to control wood-energy flows by putting in place approved rural firewood markets, defined as “places where organized structures are installed for the commercialization of wood outside of the major population centers” (Mahamane & Montagne, 1997). The aim was to move away from a long and costly policy of “piecemeal” forest management, as practiced at Guesselbodi, one forest at a time, to a large-scale forest management policy capable of covering the entire country cost-effectively and in a minimum of time. Photo 1. 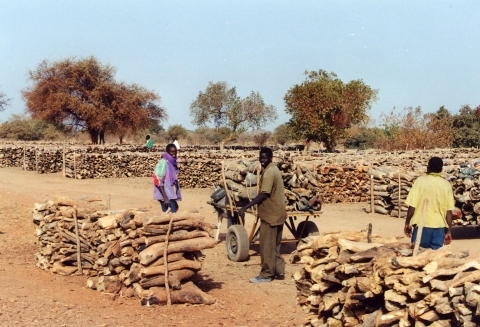 Rural firewood market at Mossipaga, Niger (credit: Alain Bertrand). 32The second axis of this strategy was to put in place an innovative fuelwood taxation system, innovative both in its actualization of the levy – raised to FCFA 600 (€0.9) per stere (FCFA 2 per kg) – and in its method of collecting and distributing revenues, which made local populations accountable by authorizing them to collect wood trade duties on behalf of the state. Decree 92-037 of 21 August 1992 implemented this new structure for the fuelwood trade, in which rural producers also acquired the capacity to negotiate the price of their wares with the traders and hauliers. 33These new provisions were also designed to help redefine the role of the administrative bodies, notably those in charge of forestry control, in a less repressive direction. By reinforcing the monitoring of wood traffic coming into the towns and cities, the forestry officials were able to reassure the villagers in the rural market scheme that the logging firms would not be able to bring their own hired personnel into the forests under management. This system of city-gate inspections resulted in a real (and deliberate) increase in wood prices, for the producer and therefore also for the consumer. Another important consequence was that, in the areas where rural markets had been created and where the tax distribution mechanism allowed the villagers to keep part of the proceeds (between 30 and 50% depending on the type of management), taxes were levied almost automatically. 34The fundamental change in the role of the forester was to make him an advisor to the villagers on forest management matters, while maintaining his official status. The regulatory and fiscal reform of 1992 transferred to the village communities the responsibility for managing the forest resources on their land: it gave them the exclusive right to exploit the fuelwood and to levy taxes, but also the duty to comply with certain operating conditions (annual quotas, set-aside, etc.). 35The procedures for setting quotas – essential for respecting the fragility of forest ecosystems – were redefined year after year on the basis of a series of studies from the 1990s onward. The findings of studies conducted by ORSTOM,7 collated in the work of Peltier, Ambouta and Herbès, 1995, enabled a better understanding of the forest stands on the plateaux of western Niger, while Nigerien researchers (Ichaou, 1998 and 2000) found answers to the question of how to regenerate these stands once they had been harvested. 36What was new about the HES approach was that it stressed the need to establish a linkage between forest management, forest control and forest taxation. Sustainable management is impossible unless the communities that are made accountable for its implementation, through harvesting and marketing quotas, are controlled. In the longer term, the system of control must also be made sustainable by being managed by the sector itself, and funded by the levies. Photo 2. Demonstration of the minimum usable diameter of 6 cm (credit: Oumarou Amadou). 37A new task allocation is in place. The state forestry officials are no longer mainly charged with policing the forests, everywhere and against everyone; on the ground, in their villages, the rural populations manage their resources locally, and maintain their own surveillance. The officials must, however, intervene at the request of rural communities to help them enforce their monopoly on their forests, if loggers or hauliers are found to be operating in areas where they are not authorized. 38This a complete turnaround of the forest police role envisaged by the legislators of 1935, protecting the forest against potential enemies, foremost among them the peasants and pastoralists. The new forest police in rural areas no longer try to exclude the peasant farmers from the forest resources. To the contrary, they are there to uphold and enforce the legitimacy, and the monopoly, of village-based management. 39Table 1 below summarizes the fundamental change brought about by the texts of 1992 relative to the provisions of the earlier system. From a bipolar relationship between the administration (which issued operating permits) and the logging firms, leaving rural communities out of the harvesting/marketing loop, we have moved to a system based on the development of rural markets, in which the people who live alongside the forest themselves issue the transportation coupons and become the sole point of contact for the logging and haulage firms (Table 1). 40The purpose of this forestry policy was to help Niger to organize sustainable supplies for the main towns and cities of Niger, starting with Niamey. But the state’s resources were never really harnessed to support the implementation of the policy, and it was mainly projects backed by international sponsors that bore the burden, notably, of creating the rural markets. 41The Energie II project from 1989 to 1997, supported by the World Bank with a fund set up by the Danish International Development Agency (DANIDA), was succeeded by a World Bank IDA fund from 1998 to 1999. Then, from 2000 to 2002, a DANIDA fund enabled the implementation of the Domestic Energy project. In 2002, the Natural Forest Management project, with the support of the African Development Bank, pursued the nationwide rollout of the rural market scheme. 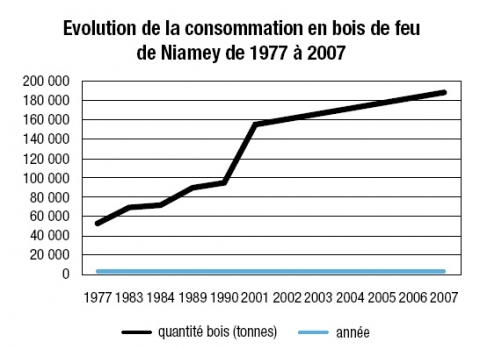 In the wake of the Energie II project, the level of fuelwood supply to the city of Niamey had shot up from 1% in 1992 to 15% in 1995. 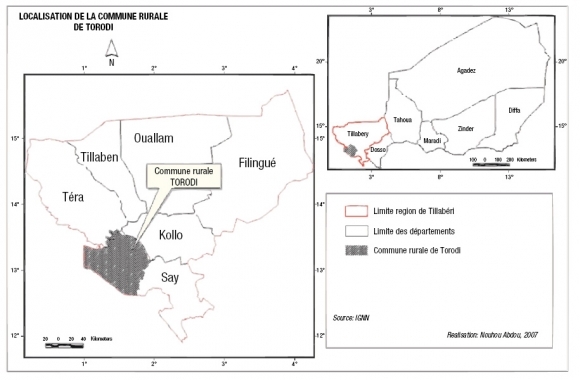 But there would be no major change in the rate thereafter, due mainly to the absence, after 2002, of support actions in the rural district of Torodi, Niamey’s main source of supply. 42In spite of research demonstrating the sustainable nature of the operations conducted in the rural markets (Ichaou, 2000), the HES was accused of being responsible for the degradation of forest stands, although numerous studies pointed to land clearance as the main culprit. Additionally, many forest rangers persisted in the “bad” habits of the forest police of earlier times, either ignorant of, or deliberately ignoring, the efforts of Forestry Ministry officials to promote the new forestry policy. These efforts in favor of the HES were confirmed in 2004 with the promulgation of the Forestry Act 2004-040, superseding the Act of 1974. The new text conferred still greater legitimacy on rural markets, consecrating them as tried and tested instruments for promoting the responsible participation of local communities in forest development and the integrated management of local land-related business. 43By the end of 2007, fuelwood consumption in Niamey had trebled, from 70,000 tons in 1977 to more than 200,000 tons (Figure 1). The rural district of Torodi (Map 1), with a surface area of approximately 7,000 km², was by itself able to provide an annual output of 435,000 steres (about 145,000 tons). But the 335,000 hectares of forest (and their 8 million steres of standing wood) remain under strong pressure from land clearance, threatened by agricultural and pastoral over-exploitation, as well as by over-logging. Nonetheless, to measure the importance of this activity for the municipality, it should be borne in mind that it generates a pre-tax revenue of almost FCFA 500 million for fuelwood, and netted more than 50 million in forestry taxes in 2007. Thousands of actors are involved: loggers, hauliers, traders, gum tappers and harvesters of other non-timber forest products (NTFPs). Photo 4. Loading a firewood truck, Torodi, Niger (credit: Pierre Montagne). 44The best way to understand the success of the HES is to track the pricing structure over a 20-year period. Table 2 shows that the price of wood per kilogram had increased by FCFA 10, but, more importantly, that the distribution between actors had significantly changed. The loggers’ share has been multiplied by 3, mainly to the detriment of the hauliers, who have lost 1.4 FCFA per kg, but who above all have seen their share of the selling price fall from 24% to 12%, reflecting their diminished capacity to impose their prices, and thus their profit margins. Equally of note is the increase in taxes, showing that the at-source option is the key to successful tax collection. The managers of the rural markets levy the taxes and, crucially, pass on the state’s share. Nobody would have believed such a result to be possible in 1990, when the Energie II project was launched. It is essential to recognize, however, that 20 years is not enough, in a very difficult political and economic context (2 coups d’état and a restructuring of the economy), to completely erase 70 years of forestry policy dominated by protection and repression. Given the progress that has been made, the central issue that remains is not the validity of these changes, but how best to apply them and change them for the better (without returning to the past). 45From 2007 to 2011, CIRAD and its development and research partners (the NGO ABC Ecologie and INRAN, respectively) implemented the GESFORCOM project. One of the project objectives, within the scope of the rural district of Torodi, was to relay the foundations of the HES (planning, transfer of management and forest control self-financed by innovative forestry taxation) in order to improve its component parts and thus give new impetus to development. 46Given the large volume of timber felled – several thousand tons a year – the question of sustainability is on everyone’s lips, and has given rise to many criticisms, to which the official response is that consumption is also on the increase, driven by demographic growth, and it is simply a case of supply following demand. The HES therefore aims to put in place the conditions for sustainable management by training the people involved, and introducing standards, such as quotas on certain parameters of forest stands (surface area, condition, etc.). 47The rural district of Torodi is the main source of fuelwood for Niamey, and met 47% of the city’s needs in 2007. 48% of the municipality’s surface area is covered by plateau forest and 43% by cereals, mainly food crops (millet and sorghum) (Table 3). A 13% reduction was also observed in the forested surface area between 1996 and 2007, revealing that the principal threat to the forests appears to be land clearance – itself linked to demographic growth – rather than logging as such. From 1996 to 2007, the surface area of agricultural land rose at a regular annual pace of 2%. Over the same period, the average fallow time dropped sharply, from 7.5 to 2.5 years (SAFT, 2008). Photo 5. One-year stump sprout of Combretum sp. post-harvest, Nioumpelma region, Niger (credit: Pierre Montagne). 48Looking beyond these observations, the work of Ichaou, (1998, 2000, 2011) has demonstrated the stump regeneration capacity of these plateau forests which can, after harvesting, have a growth potential of 0.419 m3 ha-1 year-1 whereas an unexploited forest will have a natural growth rate of 0.256 m3 ha-1 year-1 (Figure 2). 49Consequently, even if the resulting shrubland remains a rather specific domain (Ambouta, 1984), a link can be demonstrated between forestry operations and carbon sequestration, thereby justifying the setting up of rural markets. 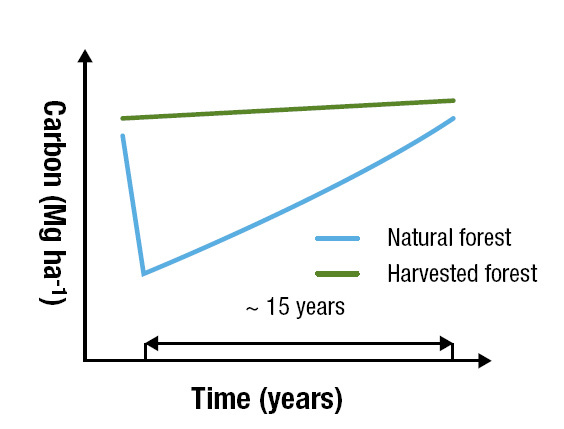 Logging has a positive impact on the dynamics of the forest in that it opens up the stand (though the effect does not bear comparison with stands in dense forest areas). It is therefore in the stump regeneration capacity that the carbon storage function lies. 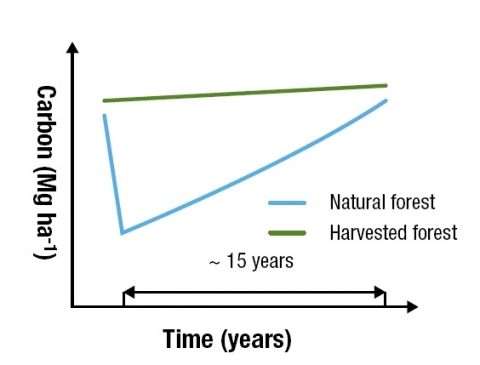 The carbon sequestration rate is higher than before the forest was harvested, and the carbon stock can be expected to be reconstituted in 10 to 15 years. The key point here is that the stands are different pre- and post-harvesting in terms of their floristic composition. The average diameter of the stems tends to diminish, and one finds a reduction in the proportion of stems of more than 20 cm in diameter, along with an increase in the number of stems per hectare. There is also greater pressure on the species Combretum nigricans, much sought after for its energy yield but which also produces gum, the sale of which provides an essential source of income for women. 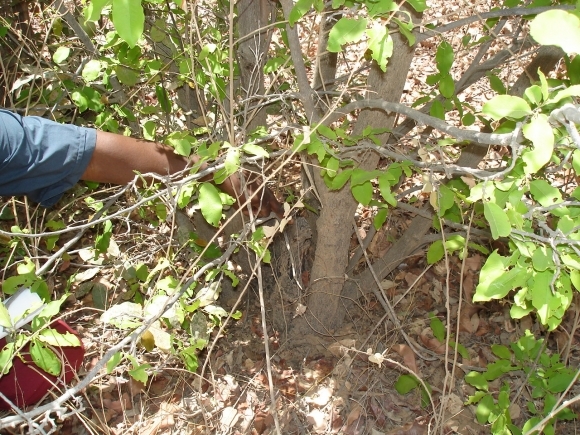 This double use of Combretum nigricans induces competition for the resource, to the detriment of the women (Rives, 2011). 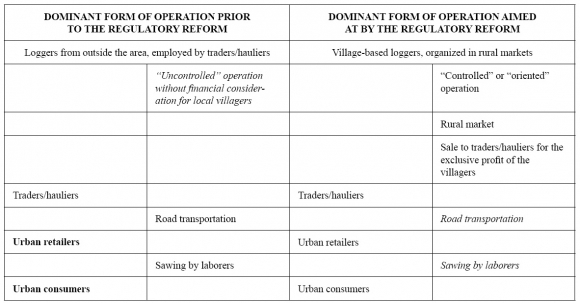 50Logging is the main money-making activity for 55% of the villages (belonging to the 62 rural markets). It occupies thousands of people: woodcutters, hauliers, retailers and managers all benefit from the more than FCFA 500 million (from wood sales) that flows into the villages every year. Likewise, FCFA 50 million in annual taxes are collected by the rural market managers and redistributed between the villages, the municipality and the state. The average income per logger per year is FCFA 100,000. This income has remained constant over the last 10 years. It is used to buy food (staple products and cereals during the lean season), livestock, clothing, and sometimes healthcare. 51This new wealth has helped staunch the rural exodus (a 29% reduction) and improve food security by 12%. Collective investments have been made in healthcare, water supply and education. 90% of the funds go to the villagers in the form of wages for local woodcutters, pay for the managers of village market structures, and contributions to village development funds or the village treasury, while 6% goes to central government, and 4% to local government. Photo 6. 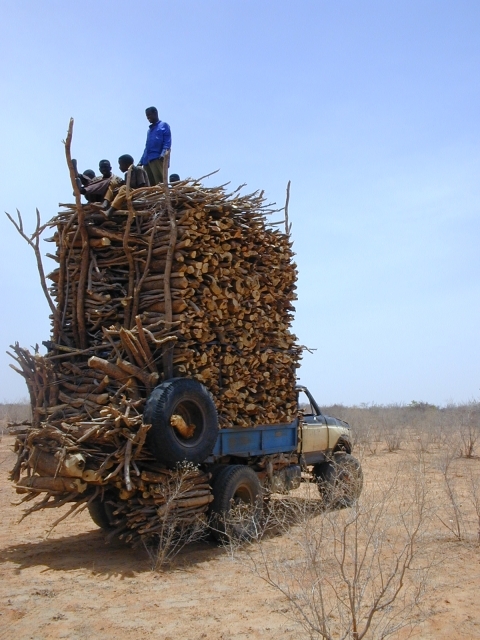 Firewood stock before loading and transportation to rural wood market and thence to Niamey, Niger (credit: Pierre Montagne). 52The real change relative to the period before 1990 is that, prior to the creation of the rural wood markets, all of this wealth flowed into the towns (as the woodsmen were employed by the logging firms), whereas today the de facto monopoly of village-based wood-cutters and the money that changes hands in the rural markets – added to the payment of taxes – mean that 90% of the funds remain in the municipality. 53Transferring the management of forest resources from the state to the local communities means devolving a number of rights, but the communities must also comply with every element of the requirements. The main difficulty here remains the monitoring of operating quotas, and more generally of compliance with forestry plans, including compartment boundaries and management rules (height of cut, diameters, species etc.). Controlling tax collection can still be difficult, although there are many signs of willingness on the part of managers to “pass on” the sums due to the state (i.e. 50% of the taxes). 54The effort made by Niger, with the aid of the GESFORCOM project, has focused since 2007 on the design, implementation and monitoring of a system of Decentralized Forest Control (DFC) in the rural municipality of Torodi to help it move – with the support of the state and its decentralized services, in particular the Torodi forest station – towards the local and sustainable self-financing of forest management. Between the rural market and Niamey (supply route): the forestry administration is responsible, via authorized control posts, for checking the conformity of loads against the transportation coupons, and penalizing or referring infringements.These posts are, in turn, inspected by a national brigade. The loss of effectiveness of the forestry control posts, with underequipped and unmotivated officers ceding more easily to temptation and corruption. 57In 2004, Niger began a process of decentralization, creating devolved local authorities, with the municipality as the lowest administrative unit. The role that the municipalities are called upon to play in local development is defined by a legislative framework. The competencies transferred to the local authorities include land management, the environment and the management of natural resources, livestock rearing, agriculture, fishing and the waterways. 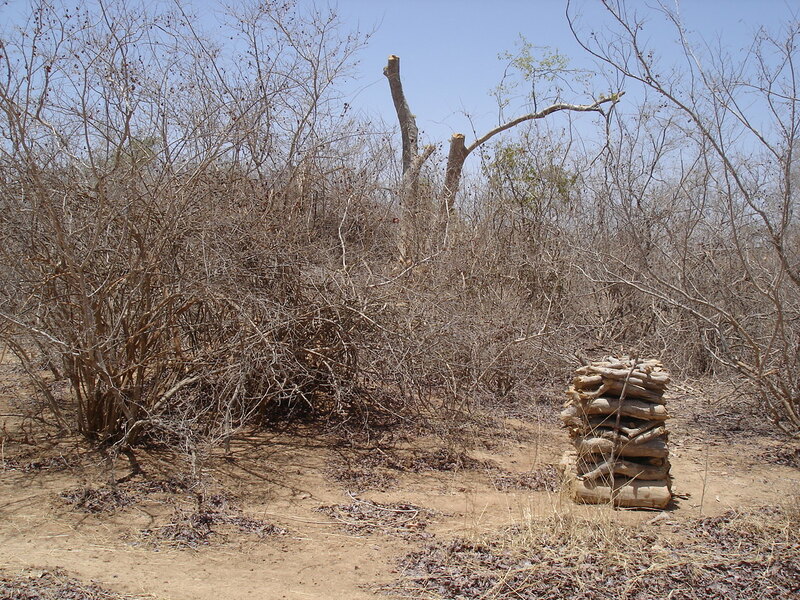 58Niger’s latest Forestry Act (Act 2004-040 of 8 June 2004) takes account of this political reconfiguration. It gives local authorities a central place in the management of the nation’s forest assets. It instates the principle of responsible stakeholder participation, notably that of local authorities and local populations in the planning, preparation, implementation and evaluation of forestry activities. 59The implementation of the GESFORCOM project by CIRAD and its partners has brought about, through the application of these texts, a significant improvement in control and monitoring, by giving responsibility to the municipality, which has recruited six Decentralized Forest Control (DFC) officers. These municipal agents are financed by a DFC support fund, which is maintained through a municipal rebate worth FCFA 2000 per truck, 10% of which is reinvested in the DFC. To this is added a voluntary contribution of FCFA 100 per stere from the woodcutters. Over the 20 months since it was set up, the scheme has generated almost FCFA 27.5 million and has covered the salaries of the six municipal control officers. 60Under this new scheme, the municipality handles the recruitment, management and oversight aspects of the system and participates in its funding. The local forestry service is responsible for monitoring and technical supervision and provides evaluation expertise. The rural markets, finally, supply information to the DFC officers and participate in financing and evaluating the system. This arrangement ensures ground-level technical, institutional, fiscal and commercial supervision of the LMSs, while providing the municipality, the forestry administration and the rural market management structures with indicators, as and when needed, to assess the sustainability of forestry operations to assist in decision-making, as well as providing a framework for communication between forest resource management actors. 61The financing mechanisms are controlled by the actors: by the LMSs, via the levy of FCFA 100 (€0.15) per stere of wood sold, which is under the responsibility of their Federations, and also through the allocation of 10% of the revenue from the municipal rebates on wood haulage trucks. 62In this spirit of transparency, allocation keys have been established, to determine how the collected funds are used. The allocation takes into account the direct costs of running the system, the cost of the support provided to the system by the Federation of LMSs, the Environment Department and the municipality, and the rebates accorded by the managers who collect the funds. Table 4 shows how the FCFA 100 are allocated: 70 FCFA are earmarked for the running costs, 10 FCFA for the manager rebate, 10 FCFA for support from the Environment Department and 10 FCFA for support from the Federation. 63Likewise, the 10% levied by the municipality on wood trucks is allocated as follows: 50% for the running costs, 40% for the management assistance that the municipality provides for the DFC agents, (including the support provided by the municipal receiver) and 10% for the payment of the tax official or manager tasked with collecting the charge from the hauliers (Table 5). Mission or training report templates, used by everyone performing support-role missions. 65Over the last 20 years, the community forest management schemes under Niger’s Household Energy Strategy have shown that they are both real and resilient. And this despite many setbacks, due partly to the fact that the state has never really had the means, without external assistance, to support the schemes, and partly to the skepticism (if not out-and-out opposition) of forest officials, evident in the continued persistence of the predatory behaviors of the past. New habits have taken root and, little by little, rural actors, including at municipal level, are taking ownership of these fundamental changes. 66It should be noted that the HES has never been called into question by the Environment Ministry. Quite the contrary: it has been reinforced by the promulgation of the 2004 Act, bringing into law the initiatives undertaken since the 1992 decree that created the rural markets. 67In a context where demand is inelastic, due to demographic growth, and where there is no real alternative energy source8, the HES emerges as the only sustainable solution for preserving resources and combating poverty. These reforms – relating to state decentralization and the design of the DFC, as well as to the geographical extension required to reinforce the economic weight of rural markets relative to uncontrolled logging – require continued support. For proper forest management, it makes no sense to seek to implement these reforms in the space of a few years. A longer timeframe is required if all the actors are to fully understand and play their allotted roles. These efforts must be pursued! Bergeret, A., 1990. 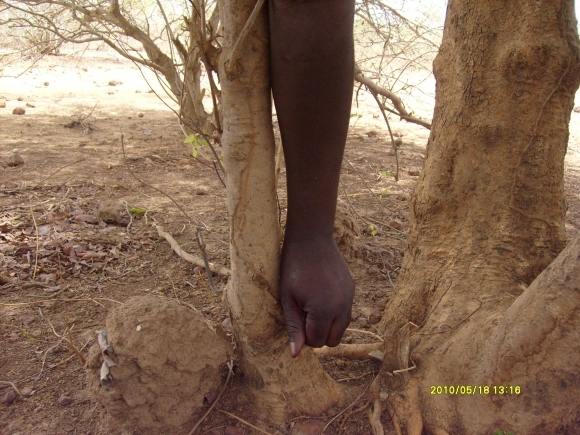 L'arbre nourricier en pays sahélien. Paris : Maison des sciences de l'homme.237 p.
Bergeret, A., 1993 ; Discours et politiques forestières coloniales en Afrique et à Madagascar, in J. Pouchedas, Colonisation et environnement, in Revue française d’histoire d’outre-mer, t. LXXX, N° 298, Paris. Bergeret, A. 1995; Les forestiers coloniaux français. Une doctrine et des politiques qui n’ont cessé de ‘rejeter de souche’, in CHATELIN, Y., & BONNEUIL, C., Nature et environnement, ORSTOM, Paris. Bertrand, A., 1985; Les nouvelles politiques de foresterie en milieu rural au Sahel. Réglementations foncières et forestières et gestion des ressources ligneuses naturelles dans les pays de la zone soudano-sahélien ; in Bois & Forêts des Tropiques, N° 207, p. 23-39, Nogent/Marne. Bertrand, A., 1995 ; Nouvelle politique forestière et marchés ruraux du bois énergie au Niger : le transfert de la gestion locale des ressources ligneuses aux communautés rurales ; in Cahiers Agricultures ; N° 4, pp. 185-193 ; Montrouge, France. Delwaule, J.-C., & Roederer, Y., 1974 ; Le bois de feu à Niamey ; in Bois et forêts des Tropiques, N° 152, pp. 55-60 ; Nogent / Marne France. Hamadou M., 1998. Etude sur les A4R@ des acteurs à la base suivant les différentes formes d’organisations villageoises au Niger. Institut International pour l’Environnement et le Développement 103 p.
Herbes J.M., Ambouta JMK., Peltier R., 1995. Fonctionnement et gestion des écosystèmes forestiers contractés sahéliens. John Libbey Eurotext, Paris. 271 p.
Ichaou, A., 1998. Contribution à l’étude de la végétation contractée des plateaux le long d’un gradient pluviométrique et latitudinal de la zone Ouest du Niger. Thesis in Applied Biological Sciences. Université de Ouagadougou Burkina Faso. 126 p.
Lavauden, L. 1934. Histoire de la législation et de l’administration forestière à Madagascar. Revue des Eaux et Forêts, Nancy. p 949 – 960. Madon G. et al, 1996. Propositions pour une deuxième phase de mise en œuvre de la stratégie énergie domestique. SEED / CIRAD - Forêt, Projet énergie II Niamey 100 pp. Mahamane EL, Montagne P. 1997. Les grands axes stratégiques du projet Energie II – volet offre pour une gestion rationnelle des écosystèmes forestiers péri-urbains au Niger. In d’Herbès J.M., Ambouta J.M.K., Peltier R., éds. Fonctionnement et gestion des écosystèmes forestiers contractés sahéliens. John Libbey Eurotext, Paris : 155 – 167 Niamey. Niger. Montagne P., Bertrand A., 2006. Histoire des politiques forestières au Niger, au Mali et à Madagascar. In : Bertrand Alain (ed. ), Montagne Pierre (ed. ), Karsenty Alain (ed.). L'état et la gestion locale durable des forêts en Afrique francophone et à Madagascar. Paris : L'Harmattan, p. 54-83. Najada I., 1981. Analyse du secteur forestier et propositions. Le Niger. Volume I : rapport CILSS. OCDE, Paris 138 p.
Rives F., 2011. Gestion des forêts sèches à Madagascar et au Niger. Vulnérabilité et Fonctions des systèmes socio-écologiques pour comprendre les réformes forestières et leurs effets. Partie I : Synthèse. Doctoral thesis in forest science, Institut des Sciences et Industries du Vivant et de l’Environnement (AgroParisTech). 165 p.
SAFT, 2008. 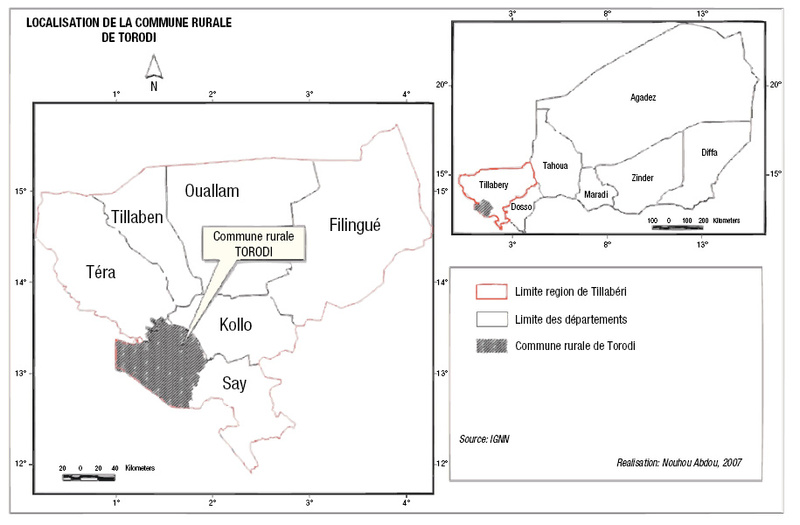 Schéma d’aménagement forestier de la commune de Torodi. Projet GESFORCOM. ABC Ecologie. CIRAD. INRAN. Niamey. 105 p.
Yamba B., 1993. Ressources ligneuses et problèmes d’aménagement forestier dans la zone agricole du Niger. Thesis in biogeography/ecology. Université Bordeaux III. 391 p.
2 The rate indicated in the official texts (Act 59-19); this corresponds to FCFA 0.12 per kg if a stere is assumed to weigh 300 kg. In 1987, this rose to FCFA 1.2 per kg. 6 From 1989 to 1998, the Energie II project initiated and implemented the Domestic Energy Strategy, building on the observations explained earlier, and thanks to Danish International Development Agency funds managed by the World Bank. 8 The recent discovery of oil in eastern Niger, and therefore the possibility of extracting natural gas, holds out the prospect of a substitute for part of this domestic energy consumption, but firewood will remain dominant for a long time to come.